Duke's strong showing at the ACC Tournament this past week earned it top billing across the board. On Sunday, the Blue Devils earned the No. 1 overall seed in the NCAA Tournament. On Monday, they came up at No. 1 in both the AP and Coaches Poll top 25. The move in the Coaches Poll is a four-spot leap for Duke, which received 25 of a possible 32 first-place votes. Last week's No. 1 team, Gonzaga, fell to No. 3 in the rankings, while Virginia held steady at No. 2. 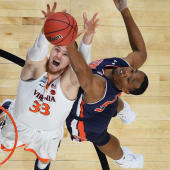 Gonzaga received three first-place votes; Virginia and Tennessee received one first-place vote each. Others receiving votes: Maryland 31; Mississippi State 24; Seton Hall 7; Arizona State 6; Murray State 6; VCU 5; Washington 4; Louisville 3; UCF 3; Oregon 2; UC Irvine 2; Liberty 2; Florida 2.